as if all is right with the world. First of all, I do have a name. You’d think the all-stars at NR could hire someone capable of inserting my name in the salutation. You could spend the week of November 11th raking leaves and cleaning gutters while you Monday morning quarterback the election results. Or, if you took the wiser course, you’ll be spending that week enjoying seven sunny days and cool nights sailing the balmy tropics, mixing and mingling… . Here’s a news flash for Rich, Kathryn, Jonah and the gang. You put your pants on the same way I do. 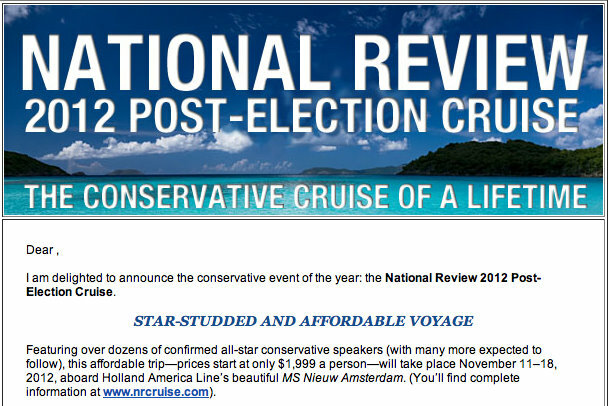 My Big Life does not include shelling out two grand to be on a boat with a bunch of all stars. Good thing this isn’t a political blog!